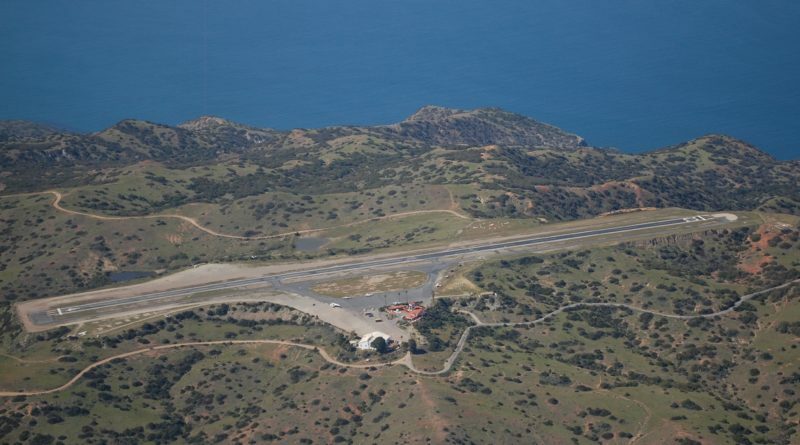 CATALINA ISLAND — Catalina Island’s airport, known as “Airport in the Sky,” has been in the news lately, as the U.S. Marine Corps prepares to repair the aging runway as a training exercise. Those who are not too familiar with Catalina’s history and layout may not be aware of the airport’s own unique story. Airport in the Sky, another one of the island’s hidden treasures, is still active today and offers an array of activities, but how it began is truly an interesting part of the island’s beginnings. The original airport hangar was actually created to operate in cooperation with Wilmington-Catalina Airline, Ltd. and was built on Hamilton Beach in the 1940s. Imagine if Hamilton Beach, one of the busiest tourist locations in Avalon, had remained an airplane landing area. Builders too must have also recognized this dilemma and carefully took the hangar apart, relocating it to the current location where Airport in the Sky, hangar and all, still stands today. Philip K. Wrigley, whose part in creating the Catalina Island many folks know today, was largely responsible for the construction of Airport in the Sky. The hangar, which can hold several large planes, also held Wrigley’s DC-3 when he visited the island. Airport in the Sky officially opened on June 27, 1946 and offered cross-channel flights through United Airlines, another partner with Wrigley who had been working for many years to offer flights to the island. One feature of Airport in the Sky that attracted visitors was the patio near the airport’s iconic administration building – to this day, travelers can still enjoy lunch, such as a buffalo burger or notoriously famous cookies, at this location. When the flights were introduced, United Airlines offered 10 flights a day (13 on Fridays, Saturdays and Sundays) at the price of $5.50 per individual for round trip. Born and raised islander, Hugh T. “Bud” Smith, who eventually became mayor of Avalon, was a pilot for United and also flew the route to Catalina. In between, Catalina Airlines was introduced, but by 1959 Airport in the Sky was re-opened to serve private planes. As recently as July 2018, an accident took place where three people traveling to the island were injured. Accessing the airport’s landing space might be difficult, yet it does not stop visitors from enjoying luxury plane rides to the island. This article was written with resources from “Catalina by Air” by Jeannine L. Pedersen and Catalina Island Company’s official website.